Can expedite users completing tasks toward "activation"
A logo works great, or if you have a person as an introduction (like a CEO or a Customer Success Manager) that works well, too. Add a headline and some welcome text. The latter can be a reiteration of your mission or an explanation of what's to come after this welcome message. Use a "Header 1" size from the "Aa" dropdown for the headline. Personalize the flow with the user's "First Name" by using the person icon. 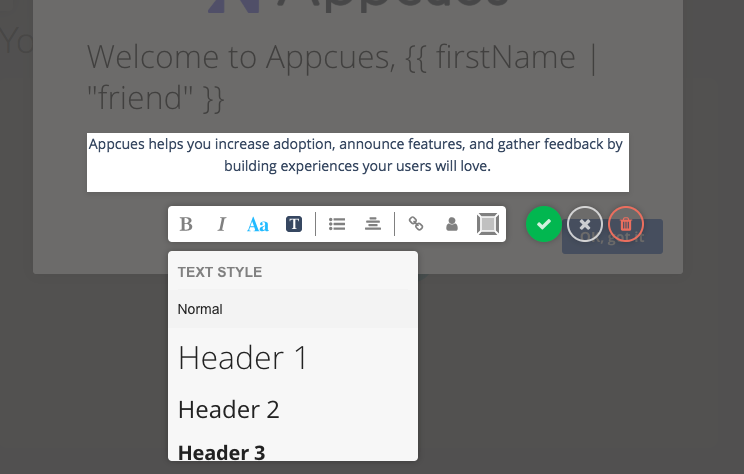 If you're not sending Appcues a "First Name" field, see the User Properties Overview to learn how to start. Click the same green "+" button to add paragraph text and use the "normal" option for size. We're going to trigger a product tour once the user clicks "Tell me more", here's how. If you haven't built the tour yet, don't fret! Simply don't select the "Trigger Appcues content" option and change the button text to something like "Let's get started". The welcome message will simply close and the user will enter your application. You can build your tour and add it later. Here's a Product Tour example you can use to get started. Good work! You're ready to make sure your Theme is set correctly and target the proper users. Read on! 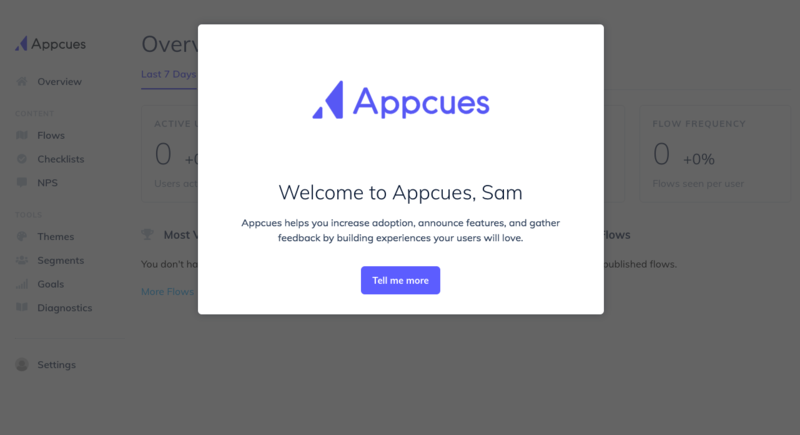 There are two main considerations around which users should see this welcome modal. One, that the user is actually a new user and, two, that this welcome modal is seen before any other content you may have created. The targeting measure is mainly to ensure your existing users don't see your welcome modal. In settings (either in Target & Publish from before or in the Web Dashboard), select the "created at" (or whatever name your team gave the property) and set the date to the day you will set the modal live. 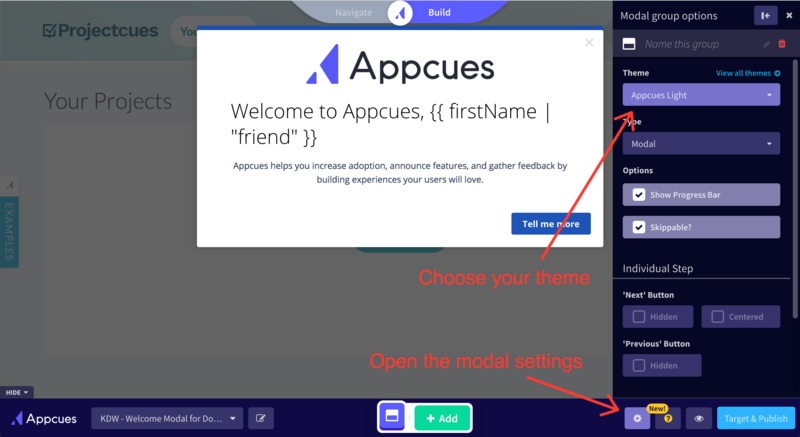 This will ensure only users who sign up after 12/10/2018 will see the modal. ie, no one would see this until 12/11/2018 in their timezone. Or by creating a Segment and adding the Segment to the other flows.